Read Our Balloon Pumps Review Before You Buy! Balloon pumps will save you a lot of "huffing and puffing". Is a manual or an electric inflator better for you? Read our tips before you buy. The pumps come in a variety of price ranges, from just a few dollars up to several hundred for the electric versions. Considering the amount of money at stake, you want to understand your options and make the determination if investing in electric inflators is worth the cost. So what is a balloon pump? It is a device that helps you inflate a balloon without having to blow and blow. If you are only inflating one balloon, doing it with your mouth is probably not that much work. However, if you are working on dozens of balloons for animals, a party, or decoration, a pump is a must have. A hand pump is great for several reasons. First, they are sturdy. They do not feature a lot of bells and whistles, so they are simple to use and the likelihood of them breaking is minimal. Prices for good quality hand pumps range between $5 and $8. Also consider manual pumps that are operated with foot pedals. This takes a lot of working out of the cranking and pumping motion that can wear out your arms, hands, and wrists. On the other hand, foot pump machines are cumbersome and take up more room. 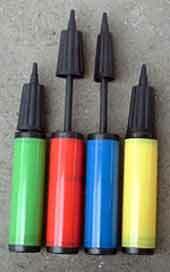 If you inflate large batches of balloons, you may want to look into getting an electric pump. Most inflators are small and easy to transport. Some even come in fashionable colors making them more festive for the event. They use pressure to inflate balloons quickly, and the best ones come with a cooling system to keep the motor from overheating. An example would be the Cool Air Inflator as seen in the image. Price for this machine is about $200. Many electric balloon inflators come with warranties, so if you are concerned about investing a few hundred dollars in the machine, you can rest assured you will have manufacturer support for a year or two. If you often work in locations without easy access to power outlets, consider getting a battery operated pump. But make sure the battery power lasts long enough to blow up all the balloons you need. Plus, battery replacements can get expensive. For most occasions, how many balloons need to be inflated? Do the environments in which you inflate the balloons have noise restrictions? Some electric pumps can get loud. 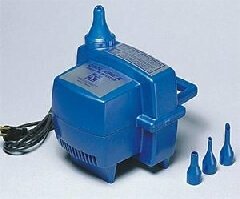 Is the weight of the pump important and will you have a problem lugging an electric pump from place to place? Will you be working in an environment with electrical access, and will you have a space protected from the elements? Electric pumps would be dangerous if a sudden rain storm broke out while you were working outside. Finally, be sure any pump you purchase comes with all of the accessories you need. Find out how much replacement parts cost before making your final decision. Remember a cheap pump may cost more in the long run if you are constantly paying for replacement materials.